I'm a headphone guy at heart. I believe all my readers pretty much know that by now. As such, I spend far more time listening to headphones than speakers. Ok, maybe that's not completely accurate if we count every bit of time spent hearing sound coming out of a speaker. Between TV watching, movies, background music, cartoons for the kids... that's a lot of passive listening time. But active listening, on a decent system, where musical enjoyment is the sole activity? Definitely headphone territory for me, the vast majority of the time. The reasoning behind this is twofold. It began years ago with me not wanting to disturb the wife while listening in the middle of the night. Which, for various reasons, is often when I have the most time to kill. Then along came children and obviously that only solidified the embargo on late night jam sessions. Headphones allow for epic, three-in-the-morning, concert-volume-level experiences, kept all to myself. Just what the doctor ordered in this scenario. The other aspect, probably just as important as the disturbance issue, is the room itself. Now, for those of you with a purpose-built dedicated listening room, a sweet man-cave, or just a spare bedroom specifically configured with listening in mind – I salute you. I used to be you. Many years have passed since that time and the real world is not always so accommodating to hobbies which demand space. Such is life. In what I’ll cynically call “the real world” we end up using a living room or whatever space we can, which is generally “community space” used by the family for various non-audio activities as well. This means no colossal monolith speakers set 5 feet out from the front wall, and no space-heater tube amps with expensive/delicate glass to invite curious little hands. Oh, and probably no acoustic treatments to speak of. What’s left is likely a simple, highly reflective room with sub-optimal listening position – maybe a chair or sofa pushed up against the rear wall. The speakers are most likely closer to the front wall than would be ideal, and one side might even end up in a corner. It’s a mess all around, one certainly not befitting an expensive Hi-Fi rig. This is where I find myself — maybe not quite as bad as all that, though not too far off either. You do what you can to take care of first reflection points but there’s really not a lot of wiggle room. Nor is there any point in stuffing some crazy expensive gear in there only to find it bogged down by the room’s limitations. This is a situation which clearly calls for moderation. And that’s just what I’ve been doing ever since we moved to our current abode some years ago. I’ve had good luck with monitor speakers, versus big towers with their overbearing low-frequency response – mainly due to lack of breathing room. This is where your sealed or front ported speakers come in handy. I’ve enjoyed several Sonus Faber models, and the amazing Sjöfn Hifi ( the clue ) which practically begs to be moved closer to the front wall. One set of tower speakers that worked well was the beautiful Opera Audio Seconda (the sealed 2012 revision, not the new ported Seconda SE). But again, it’s typically monitors which work best, occasionally supplemented by a quality subwoofer (or two) if I feel the need for more extension. Despite having attained some pleasing results from various models of speakers, I’ve pretty much given up on the idea of achieving sound remotely approaching the quality of my reference headphone rig. There’s just no arguing with a HiFiMAN HE-1000 driven by a reference-caliber headphone amp such as the Violectric V281, paired with a top-notch transport and DAC and ancillaries. Same deal if I swap in my Stax electrostatic setup, or my Sennheiser HD800, AKG K812, Audeze LCD-3, etc. Sure, there are some things speakers can do which headphones can’t touch – enveloping, lifelike soundstage and pants-flapping bass response being the two main attractions. Two things that happen to be nigh-impossible without a decent room to work with. So there’s really no point in me chasing a really nice speaker rig… which is why I tend to stick with speakers in the sub-$5,000 range. Anything more is generally a waste for my scenario. “Of my parents’ three kids, I was singled out for carrying the tech torch. My mother told me that when I was just a toddler, my father made me a gizmo with switches, lights, and buzzers to play with. I don’t remember that, but remember well that when I was three, he let me ride the pedal on his shear press at JansZen Laboratory while he stepped on it. He was making parts for field test prototypes for what would later become the KLH Nine. His operation occupied a space in an industrial building in North Cambridge, Mass. He introduced me to the machinist whose shop was on the same floor. I saw very early on what a small industrial startup shop looked like, not that I understood what I was seeing. “When I was five, my father started letting me use the stereo unsupervised. His deck was a Garrard turntable and a Rek-O-Kut arm that he had mounted on a wooden base. He taught me how to turn on the system, handle the records, put them back with the inner sleeves crosswise, set the stylus down gently anywhere on the LP, all the bits. The rest of the gear was Marantz, and the speakers were KLH Nines, of course. I treated it all with reverence, but being five, I liked hearing the same thing over and over. This tormented my mother at her studies and housework, something I didn’t quite understand until she whipped a Lionel Hampton LP into the fireplace. After that, I dutifully sequenced the playback material, although not so much from empathy, but more because I didn’t want to be responsible for any more breakage of my dad’s records. “Starting at about the same time, I was taken to KLH once in a while, and my father began making occasional, apparently casual mentions of key aspects of his speaker technology. Anyway, at KLH, I met everyone, saw the lab, parts cage, production area, and offices, and even saw a serious tape deck for the first time in H. Kloss’s office. I tagged along to Acoustech once in a while later on. I started nagging for Heathkits in elementary school. In fourth grade, my father taught me how to solder and set me up with an iron, sponge, spool of solder, and hand tools at my little study desk, whereupon I built a three-tube short wave radio. I listened to broadcasts, learned how to use the regen to demodulate SSB, and briefly enjoyed getting the regen whistling on a frequency that my father was listening to on his transistor radio, but of course he quickly realized what was jamming the station. In high school and early college, I assisted with the development of the production tooling for the circular ERC-139 tweeters and with data collection on the speakers. “My family listened frequently to serious music of many sorts together, generally classical, folk, and World, never pop/rock/soul/blues, which was restricted to bedroom playback in mono on something I cobbled together from a dismantled console left behind by prior owners of a house we lived in, then a KLH 8. My parents had me study proper instruments, namely clarinet, and then piano. After those crashed in ennui and laziness, they bought me a pretty nice classic guitar when I was twelve that I still have. “Dipoles are not necessarily a bad thing. My father’s highly regarded KLH Nine was a dipole that proved the point. What distinguished it from nearly every other dipole that came afterward was that its tweeting was done by a small element (4 x 4 inches) and the bass by a large area (2 x 5 feet). The small (for a planar) tweeter means the back wave itself occupies a small in area as it propagates away in a definite direction. This avoids the creation of audible comb filtering artifacts from self-interference, because the wavefront doesn’t grossly intersect itself upon wall reflections. A sense of spaciousness is thus created without coloring the sound. “Once the panel size gets bigger, the risk of coloration increases. Although our panels are small compared to most others, they are still pretty large in practical terms. I decided to simply soak up the entire back wave in the electrostatics’ own sub-enclosure to eliminate the possibility of interference colorations, while coincidentally allowing placement directly against a wall. The lack of a back wave along with the panels’ controlled directivity also maximizes the proportion of recorded ambiance over the local room ambiance. This creates more of a you-are-there experience than they-are-here, with unique ambiance for each recording, rather than all the same. Imaging is improved when there’s less local ambiance, too. “The KLH Nine tweeter has a layer of material over its back that damps its resonances while coincidentally reducing the loudness of the back wave. Such damping is critical to accurate transient response, preventing the membrane from ringing after a transient has ended. Enclosing the panels as we do makes such damping easy, almost as a side effect of soaking up the back wave. “Most electrostatics are made to look cool by being see-through. To do this, the membrane damping layer must be omitted, because that layer would block the view. Their sense of spaciousness thus comes at a considerable cost in terms of transient response. The rather tremendous amount of rear radiation also causes the room itself to dominate the ambiance on playback, rather than mostly representing the recorded ambiance. “Dipole bass, however, has a significant advantage in that the sound is mostly directed to the front and rear, and not much to the sides. This reduces bass mode excitation in the room. The KLH Nine is a dipole from about 800 Hz down, and cuts off just above 40 Hz. For bass dipoles to do this front/rear trick, though, they have to be placed far from the walls, which is not always practical. 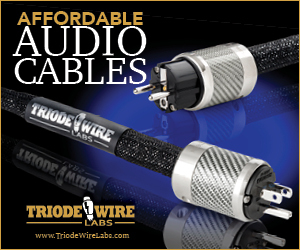 Most dipole electrostatics on the market, however, are dipoles only in the treble, and front radiators in the bass, which is the opposite of ideal, leading to excessive local treble ambiance, comb filtering artifacts, and maximum bass mode excitation. Just before the AXPONA audio show in mid-April, David renamed the speakers to get away from the nerdy, hard-to-remember, alphanumeric names (which, as somewhat of a nerd myself, didn’t bother me in the least). The floorstanders are now called the Valentina and Valentina Active, and the monitors are the Carmelita and Carmelita Active. He says he hopes no one will miss the nerd factor. 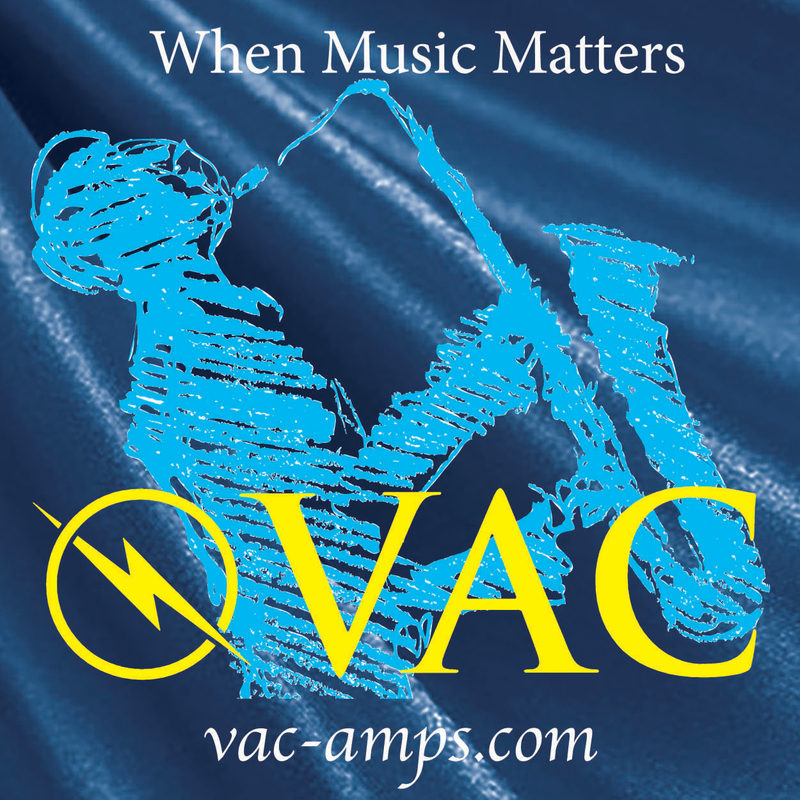 “Active designs in general offer two big advantages right from the start: confidence about optimal amplification, and elimination of speaker cables that would otherwise (a) alter the signal, (b) clutter the floor, and (c) cost money. Also, when multiple amplifiers are present in each cabinet, as with our speakers, which are two-way and thus biamplified, the crossover is done on the low-level signal, so there are no capacitors, coils, or resistors between the amplifiers and drivers. “The result is not just more efficient but also more effective. This is partly because the drivers are not part of the crossover circuit, which avoids the effect of their frequency-dependent impedances on the crossover function. It’s also partly because the lack of parasitic reactances and resistances present in the usual passive crossover components reduces energy loss and improves fidelity. 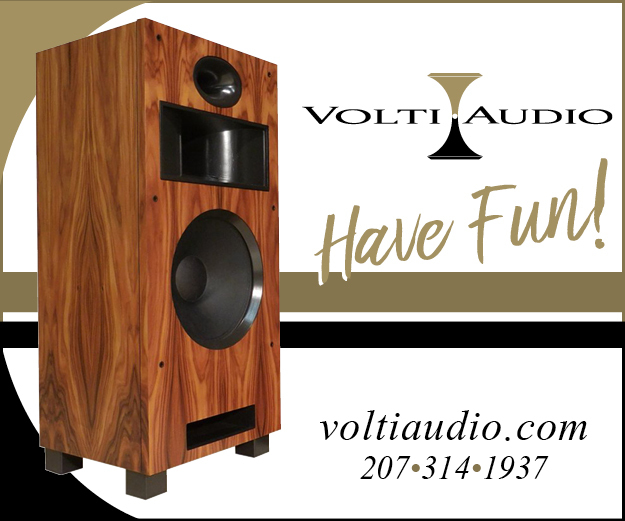 Another advantage is the best matching of amplifier power to driver requirements, allowing the highest possible SPL and best transient response without risk of driver damage. “A further advantage is the availability of active equalization (EQ), which is good for more than just creating the best possible crossover. I use it to fix cabinet edge effects and floor bounce, and clean up driver response problems, like adding poles well above the crossover frequency to prevent the woofer cone from getting signals in its breakup regions. This tweak is one of the keys to making a standard woofer work seamlessly with an electrostatic, because even the slightest bit of cone breakup is obvious on top of the perfectly uncolored sound of a well-designed electrostatic. “The result of this EQ can be a perfectly flat response or something even harder to arrange intentionally in a passive design – a very gradual roll off in the upper octaves. This mild roll off up into the ultrasonic region creates a maximally natural sound, reminiscent of a live performance in a well-designed hall. It provides a comfortable, slight mellowing of the usual, overly bright, close-mic’d recordings, yet without making audience-POV recordings sound dull. 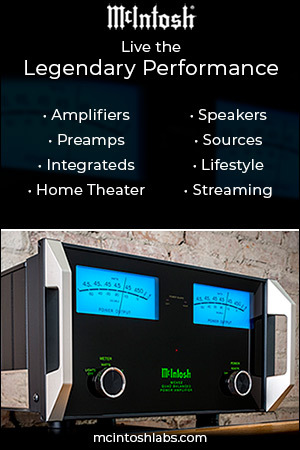 “Each speaker is internally bi-amplified by two ultra-clean amplifiers. 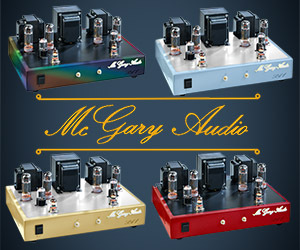 Each amplifier is rated for 190W into 8 Ohms, and 350W into 4 Ohms. 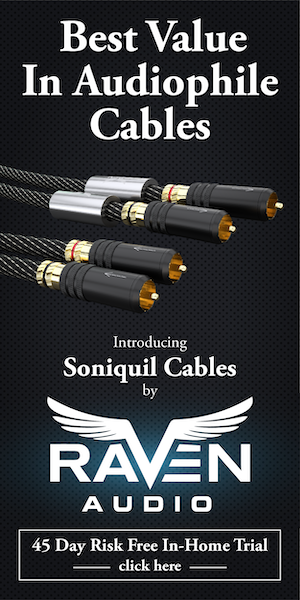 The lack of speaker cables and nearly direct connection to the drivers removes a potential hazard to accurate sound, saves money, and reduces clutter. “Sensitivity is adjustable for maximum signal to noise ratio regardless of input drive capability. 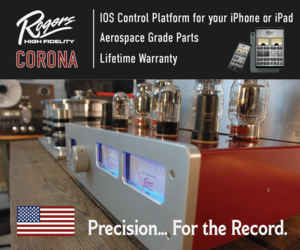 Maximum output levels and optimal S/N will always be produced, even from low output devices like high-grade portable players (and even phones), just as well as from preamplifiers and high output DACs. “The crossover is handled by DSP, so the inevitable passive crossover side effects are gone. There’s no reduction in damping factor from the DC resistance of series coils, no waste of power in coils or resistors, no off-target frequency response effects, no degradation of transient response by network resonances, and no undue phase shifting. Although DSP allows us to use a high order crossover for less interaction between the drivers in the crossover frequency range, we chose a low order to minimize DSP side effects and best align harmonics with fundamentals. “Maybe the best thing about the built-in DSP is that it provides you with four frequency response settings. You select between them by pressing a button in back of the speaker. These can be used for all sorts of things. 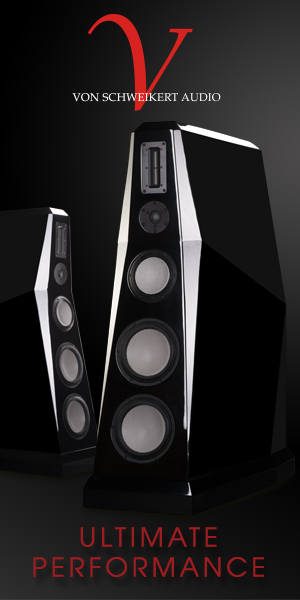 “The standard presets give you four bass levels, so the speaker can be placed more flexibly near or away from walls. In case that wasn’t completely clear: JansZen has some standard DSP profiles like near-field and low-volume listening, but can also customize an order for whatever the end-user desires. I find this remarkable in both theory and practice. 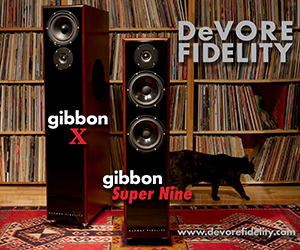 When was the last time you experienced a high-end speaker which had multiple variations on the core sound signature? 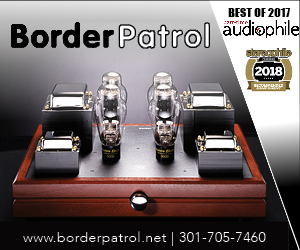 “The speakers have controlled dispersion and are quite phase correct, so they reproduce recorded ambiance very well. With binaural and most types of two mic recordings, the ambiance seems to come from well farther sideways than the speakers themselves. “On the other hand, it can happen that the ambiance is missing or not well represented on a recording. The extra bit of treble directed to the side walls by the airLayer tweeters creates the spaciousness that is missing in those cases, and widens the soundstage to create a more enveloping experience. Properly adjusted in loudness, this happens without noticeably degrading the imaging or calling attention to the existence of the side tweeters. “When seated, the airLayer thus does what you’d expect from its name, namely add a layer of ‘air’ to the sound. For those of you who say ‘air’ is the wrong word for this, I might have called it the spaciousnessLayer, but that’s quite a mouthful. “When standing, the airLayer fills in the treble that goes missing due to the extreme vertical directivity. This directivity reduces floor and ceiling effects, but causes the treble to drop off radically when not seated. The same airLayer loudness setting that’s appropriate for adding air also works for rounding out the sound when standing. Although the treble is thus dominated by the high-grade domes, the sound is quite pleasant. This is partly because the beautiful electrostatic midrange remains, and partly because this tweeter is exceptionally clean and smooth for a dynamic transducer; I selected it after evaluating many, and it’s the one I would choose if I were designing standard speakers. As I’ll discuss shortly, this option is certainly worthwhile if not completely essential to the JansZen experience. No way around it, these are handsome speakers. The appearance straddles the line between traditional and exotic – where something like a Vivid Audio loudspeaker may arguably be a bit garish, and others such as Harbeth could be accused of having an overly-tame aesthetic, the JansZen design is traditional enough not to make waves yet interesting enough to stand out in a crowd of “monkey coffins”. Personally, I happen to like the looks of Vivid and Harbeth speakers but I can see how each might clash with certain home design themes. The Valentinas seem like they would fit most anywhere without raising objections. Again, if you’ve got a dedicated space where you can fit some absurd looking megalith, I’m happy for you … but for many of us that’s just not an option. The enclosures come in a sort of understated dark grey color while solid wood is used for the front baffle. Various wood finishes can be had as well as custom paint for an added cost. The enclosure itself is approximately 36 inches tall, 11 inches wide, and 9 inches deep, but that doesn’t tell the whole story – there’s a plinth down below which adds nearly 3 more inches in height and expands the footprint to 12 inches wide by 14 inches deep. That, plus the fact that the speaker leans back a bit, means it takes up more space than those initial specs suggest. It definitely has some visual impact (but in a good way). Still, this is a relatively unobtrusive speaker compared to many other “full-rangers” on the market, and the ability to place close to walls makes it that much more versatile. This review was different from most in that I ended up moving the gear to a variety of rooms throughout the house. Normally I stick with my headphone rig or my speaker setup, swap in the component being reviewed, and I’m off to the to races. This time I really wanted to get a feel for how the JansZens performed in different spaces. Small bedroom? Big open family room? Lots of breathing room? Or right up against the wall? I wanted to try it all, and as such had a lot of work ahead of me. It wasn’t realistic to lug a half-dozen components around to each room, so I kept things as simple as possible. The active design helped in this regard – with amplification already handled, I really only needed a source and preamp. But wait … several DACs I have on hand do quite well driving amplifiers directly. The B.M.C. UltraDAC, Resonessence Labs Invicta Mirus, and even the diminutive Grace Design m9XX all did well enough that I kept my Rowland and Meridian preamps in storage. As you’ll see in the pictures I did break out quite a few different DACs and other equipment just to get a better feel for the speakers and their capabilities. With all this gear and moving around from room to room, I didn’t take complete care in making cable runs neat and tidy. So if you see a mess in some of the pics, cut me some slack, as this is not a typical scenario. My favorite gear pairing was the Resonessence Mirus DAC. Not only does it sound absolutely sublime, but it also sports built-in playback capabilities via the on-board SD card reader. I could load up SD cards with hi-res PCM and even DSD material and thus avoid adding any other devices to the chain. 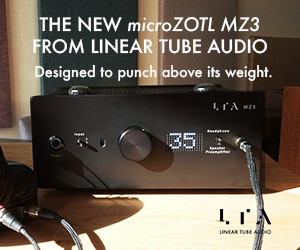 That one modestly proportioned device for source, XLR output cables to the active speakers, and….. that’s it. Ok, AC cables too, but you get the idea. My first experience with the JansZens involved a somewhat large room, with the speakers placed at least several feet away from all boundaries and approximately 8 feet from one another. 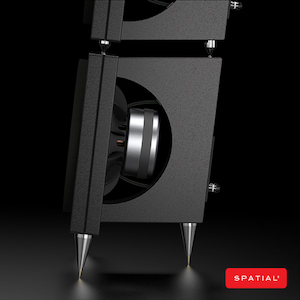 With zero optimization, just throwing the speakers in place with a slight toe-in, the resulting sound was… jaw-dropping. I know, initial impressions are typically supposed to be underwhelming. It’s often noted that if a component immediately “stands out” it usually ends up becoming problematic in the long run, while gear that initially sounds more reserved will end up growing on you. I don’t disagree with that concept in general but what can I say? These JansZens sounded far better than they had any right to considering the lack of care that went into setup. I could have simply left them as-is for the remainder of my listening and they would have earned a very positive review. That’s not something that happens with most speakers – the last time was the little Sjofn (the clue) monitors, and the time before that was … so long ago that I don’t recall. I know what you might be thinking right about now – didn’t the author, moments ago, explain he had no room for such an open placement, away from boundaries and with plenty of room to breathe? Yes, I did, and that’s normally the case for long-term situations. Once in a while I’m able to temporarily requisition the formal living room for an indeterminate period, which expires approximately “whenever my wife gets sick of my gear piled up everywhere”. So I got a good month of listening in this room before I begrudgingly surrendered it to more utilitarian needs – such as my kids building forts or generally making a mess everywhere. One more time: if you’ve got a dedicated room, enjoy it! Being a responsible reviewer, I did spend some time playing with toe-in as well as tweaking the airLayer tweeters for optimum integration. In this particular room I generally (though not always) preferred airLayer deactivated, which is accomplished on my review pair by turning the volume all the way down. As noted above, there’s an on/off button for the airLayer now, so you don’t have to remember the setting. As for toe-in, I liked the speakers firing directly at me in what I’d consider a fairly typical placement. Many speakers in my past sounded best in more or less this same configuration, though few were as forgiving of variations to the setup. Move the Valentinas several feet closer or further apart, or switch the angle of toe-in, and it doesn’t matter all that much. This is refreshing in a world of speakers demanding precise placement down to the last 1/8th of an inch. The resulting sound was among the very best I’ve encountered on any system, anywhere. Bold claim? You bet, as the total cost of this system was comfortably below $20k – including the overachieving Resonessence Labs front end which is $5k and various cabling which adds another thousand or two. Not cheap, no, but certainly nowhere near the megabuck systems one can assemble these days from an ever-growing list of manufacturers. 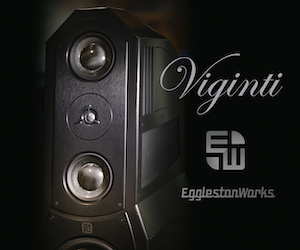 I’ve owned, or auditioned at length, speakers costing many times what the Valentinas go for and never heard anything quite this good before – and that’s not even taking amplification into account which bends the equation even more in favor of the JansZen offering. So, what do the Valentinas do that made such an impression on this curmudgeonly reviewer? The first thing that struck me was the stunningly three-dimensional presentation. I put on Cantos de Agua Dulce by Marta Gomez (DSD version ripped from the SACD, but the regular CD is quite good too) and the vocals just hung out there in space – completely detached from either speaker. They came at me from dead center in a holographic way beyond anything I’ve experienced. I could swear up and down there was a hidden center channel speaker in play, as there’s just no way a pair of stereo speakers could image this well. And this wasn’t limited to just vocals – the fantastic percussion section and guitar accompaniment was spread out in a highly convincing fashion, with pinpoint imaging putting the listener right there in the performance space. That album as well as the follow-up release Entra Cade Palabre were both recorded at Saint Peter’s Church in New York, and are both very well done (in typical Chesky fashion). The Valentinas are resolving enough to show the minor differences between each release — something speakers don’t typically do as well as the best headphones, at least in my particular listening space. Vocals on Cantos de Agua Dulce are more direct and intimate, as if Marta were standing closer to the “audience” as she sang. On Entra Cade Palabre she seems to be set back a bit further, more intertwined with her accompaniment as opposed to being way out in front. Many systems aren’t able to reproduce this subtle change in-depth, yet the Valentinas made it easy to discern. I find it interesting that I hear it best on my Stax electrostatic rig as well as these speakers – though being hybrid in nature, the dynamic reinforcement on low-end doesn’t come in to play when handling Marta’s vocals. So it ends up being an electrostatic transducer that stands out as the most “real” to my ears whether using speakers or headphones. Next I switched to a great example of low-frequency articulation — the XRCD release of Unity by Ernie Watts. The track “Tricotism” features an opening sequence that has both an electric bass and an upright acoustic bass playing simultaneously. Now, this is a great recording which sounds respectable even on a modest system … my little Sjöfn monitors do it quite well. I get the gist of the performance and will bob my head accordingly. Larger speakers I’ve owned like the PSB Synchrony One or the previously mentioned Opera Seconda do it even better. But, what separates the good from the great is the ability to track both at once without straining to hear. With the Valentinas, I felt like I could discern each separate instrument as the string was plucked, the attack prior to the full note being produced, followed by the eventual decay or next note starting up again. And not in a forced “hey look, I’m an important musical detail!! !” type of way. The JansZens sounded totally organic, like they weren’t even breaking a sweat. I didn’t feel like I lost any impact of the performance as a whole, but I was always very aware of each instrument and what it was doing. And low-end articulation? Superb, with clarity and extension on par with what I’m accustomed to from my best headphones. It is exceedingly rare for speakers to accomplish this in my particular space. Speaking of headphones… On some level I think they severely limit my ability to enjoy speakers. Since all of my full-size headphones are of the single-driver, full-range variety, I’m accustomed to a level of coherence that I just take for granted. Not that my headphones are perfect, but they certainly don’t have to deal with crossovers and the challenges of optimal driver integration. I feel like quite a few otherwise very enjoyable full-range speakers suffer in this area, to at least some degree. Single driver designs sidestep the issue but bring a host of other limitations in exchange. One I have a lot of experience with, which I found highly enjoyable overall, was the Teresonic Ingenium. But even those, with their beautiful midrange presentation, ultimately didn’t quench my thirst for convincingly full-range sound. The Valentina Active is the first speaker I’ve found which gives me everything I’m accustomed to from my headphone listening — dynamic, full range sound, with coherency not unlike a single driver design. It’s really quite something to experience. Is it the DSP which makes this “best of both worlds” achievement possible? Or the lack of passive crossover components? Maybe it’s the brilliantly matched drivers combined with the sealed enclosure design? I don’t know, but JansZen nailed it, and this stubborn headphone listener very much appreciates their accomplishment. Ok, more music. Next up is the recently released Beethoven: The Late String Quartets as played by the Cypress String Quartet. This is, in my mind, the definitive version of these beautiful and deceptively complex works from the by-then-completely-deaf composer. Not only is the interpretation and musicianship top-notch, but the recording is absolutely superb as well. As with all prior CSQ releases, this was done on the scoring stage at Skywalker Sound by recording engineer Mark Willsher, known for his work on the Lord of the Rings films (among others). Mark records to high-res PCM using a matched pair of Sanken CO-100K microphones which are renowned for their clarity – and which sometimes veer into brutal honesty. 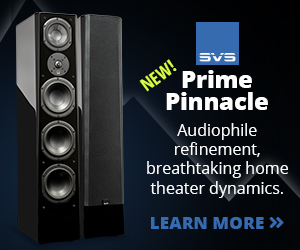 When paired with the phenomenal acoustics of the Skywalker scoring stage, and top quality A/D converters from Pacific Microsonics, the result is nothing short of breathtaking. I paid the big bucks for the 24-bit/96kHz release but honestly the CD-quality download for $30 makes a lot more sense from a value standpoint, sounding nearly as good for a fraction of the price. The Valentina Active plus Resonessence Invicta makes this recording come alive better than any other system I’ve tried, regardless of price. Tone? Definition? Brilliant transient response? Check, yep, and absolutely. The Valentina Active renders this killer performance in a thoroughly convincing way without feeling the least bit overly-hyped or “Hi-Fi”. My prior champ for playback of recordings this exceptional was the Linkwitz Orion system I used to own. That setup was lovely but again required more space than I have these days, and as amazing as I recall it sounding, I want to say the Valentinas dig a fair amount deeper into the recording. Inner detail, the texture of bows across strings, and the interplay between performers who have played together extensively for well over a decade, all come through to a greater degree with the JansZen system. I recently got to sit in the control room at Skywalker while the Cypress String Quartet worked on their 16th and final project. I’ll be writing up my little field trip soon enough — it was an eye-opening experience. But for now I can honestly say that the Valentina Active speaker system is the closest thing I’ve encountered to that level of transparency and realism, but this time existing in my own home. A remarkable achievement indeed. Next came a live album, appropriately titled Live! from the Jeff Hamilton Trio. 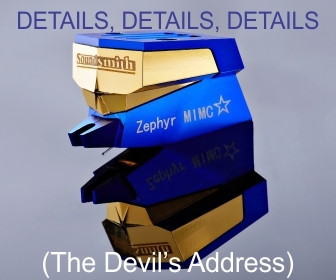 Despite being a “mere” 16-bit/44.1kHz CD rip, this one just oozes with musicality — perhaps not the most in-your-face, highly-resolving audiophile demo disc, it nonetheless captures the feel of sitting in the audience enjoying the show … which is what many of us are trying to achieve with our systems in the first place. I couldn’t help but crank the volume on the Valentinas, marveling at their ability to capture the dynamics of Jeff’s drum kit. Talk about full range! My old Teresonic Ingeniums, good as they were in many areas, just sounded limp in comparison. And how about those brushes? As a (mediocre) percussionist myself, I can’t tell you how many times brushwork sounds “weird” for lack of a better word. Wrong. Off somehow, which may not be so obvious to non-percussionists but sticks out like a bowling ball at a picnic to those of us accustomed to the real thing. 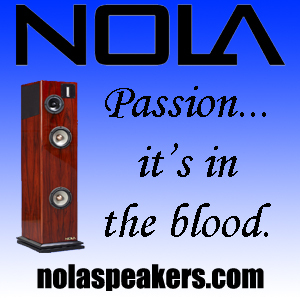 Sometimes a speaker is to blame, sometimes a recording, or often times a combination of both. The brushwork on this excellent recording, as played by the Valentinas, sounds utterly right, a feat which is surprisingly rare even on other very expensive speakers I’ve owned. Thinking back to David Janszen’s extensive technical comments above, I’m struck by the realization that this is a result of that. It may not make complete sense to us less-technical people but the proof is in the listening, and suffice to say David knows what he is doing. Thus far I’ve discussed more serious works. Jazz and classical and “audiophile” type recordings, though certainly chosen as much for their musical appeal as for their sound quality. But how about “normal” music which isn’t done to such high standards? There are quite a few bands, albums, etc. which I love from a musical perspective, yet find merely decent (at best) in terms of quality. I’m not talking absolutely terrible, Death Magnetic atrocities, but more like general stuff — Shields, Pearl Jam, The Mammals, CHVRCHES, The New Amsterdams, Nerkkirn, Zombi, Honeyroot, etc. How do these hold up on an ultra-resolving system such as this? Surprisingly well, actually. These types will never have a lifelike sense of space — it’s just not present in the recording itself. As such they will always sound a bit flat and lifeless if we play them immediately following a Chesky, Reference Recordings, or Water Lily Acoustics type recording. But if we can mentally adjust for this unavoidable loss in realism, we won’t be underwhelmed right out of the gate. From then on it falls to the speakers to reproduce whatever detail may exist without calling undo attention to the weaknesses of the recording. In my mind there are two schools of thought regarding these types of “lesser” recordings. One the one hand, people often speak of a speaker being “forgiving”, which tends to mean a somewhat relaxed response in the upper mids and highs. Since these regions are often the most problematic to reproduce faithfully, and also tend to be the most obnoxious when done wrong, this type of “forgiving” speaker may end up doing favors to these relatively poor recordings. On the other hand, it could be said that a highly accurate speaker will always give us the most faithful representation of what’s encoded on the disc (or LP or FLAC file). This theory holds that if a flawed recording is played through a colored system, there’s likely to be an unpredictable interaction between the two. So that same forgiving speaker which helps one album sound smooth, may end up making the next selection that much worse, by rolling off what is already a dull, uninvolving top end. Different colorations will impact different recordings based on the unique properties of each, hence the unpredictability. I tend to agree with the latter theory, and the Valentina Active helps prove it right. While lacking the sense of space and resolution found in better recordings, “pedestrian” releases can still sound mighty nice when handled by a clean, full-range speaker, free from top end sizzle or midbass bloat or any other exasperating coloration. So, yes, these are highly revealing speakers, and won’t turn a low-budget or mass-market release into a Bob Katz masterpiece. But neither will they automatically make a huge portion of your favorite music off-limits, as do (in my opinion) some expensive speakers. Remember, bright does not necessarily equal detailed! Interestingly, with these recordings, I tended to prefer the airLayer turned up a tad. It’s possible to dial it in just so, to where it helps open up the presentation a bit without actually revealing itself as an obvious source of sound. Crank it too high and that’s just what happens — I notice a distinct difference between the two different drivers, and the whole thing falls apart. Used sparingly though, airLayer helps inject a much-needed dose of spaciousness to these otherwise fairly boxed-in tracks. So, what about those other rooms? You know, the smaller ones? Or those with inadequate spacing which therefore require closer-to-wall placement? I lugged these things all over the house and gave them several different spaces to work with — a somewhat difficult feat made easier by the simplicity of the Resonessense Labs Invicta. Without going into excruciating detail (that ship has probably already sailed on this write-up anyway) I will simply say this: as with the initial setup, I found the Valentina Active system extraordinarily flexible. In a smaller bedroom setup, the sense of scale came through almost exactly as it had in the large room. Imaging remained tight while soundstage seemed at times significantly larger than the available space in the room itself. Interestingly, I found that I liked airLayer to be a little more prominent in this situation. It helped maintain the sense of space where no such help had been required in the larger room. I dialed it in to roughly 50% of max levels, and kept it this way even on excellent recordings. My particular room didn’t require any change of DSP settings though I can see how that might be useful. Setting things up the “long way” in my rectangular room, I was able to get my listening chair back about 10 feet and still maintain some distance from the wall behind me. If I had needed to place the speakers differently and thus had less room to work with, I’d certainly appreciate having the near-field DSP option available. Keeping the chair from being pushed right up against the rear wall is a huge benefit in my experience, and I’d willingly sacrifice a few feet between me and the speaker if need be in order to maintain that space. Speaking of walls — what happens if we get the Valentinas up close and personal with one or more walls? Again, my experimentation showed the JansZens to be very flexible in this regard, a huge win. How many times have you, whether in person or via pics on an audio forum, seen a rear ported speaker pushed right up against a wall, either beside or behind it (or both)? When you know damn well that particular speaker really needs room to breathe? It’s the type of thing where I think a lot of people would actually be better served using a smaller/cheaper but more appropriate speaker for their room. A smaller speaker in the same product family will often do less damage when jammed in a corner. But no, many people assume bigger and more expensive is always better, and that conceit really hampers the potential of their system. The Valentinas, however, just really don’t seem all that concerned with side or rear wall proximity. Where normally I would expect major changes in timbre and tone, they just keep making beautiful music. The lack of room-induced midbass bloat is perhaps the most valuable trait, followed closely by the ability to somehow maintain pinpoint imaging — often among the first things to go with close-wall placement. If given my choice I suppose I would rather give the Valentinas an ideal room setup, but that may be just as much related to my expectations as it is to the resulting sound. Seriously, as hard as it is to believe, these things sound phenomenal no matter how close the room boundaries get. Are these the perfect speakers? Surely when other models sell for two, three, five, or ten times as much, there must be room for improvement … right? Honestly, I’m not so sure. If sheer output is the goal then yes, you can get larger, more expensive, more imposing speakers which will go further towards pressurizing your room. The Valentina Active system comfortably plays well into the 100dB+ range without the least bit of strain so for me this is not an issue. The one area where other choices do have an edge is in the lowest bass region — while the dual 6.5″ dynamic drivers are extremely impressive, they don’t plumb the depths in the same way as something like a Legacy Audio Aeris with dual 12″ drivers powered by an on-board thousand watt amp. While the Valentina Active sounds linear in my room to the high-20Hz range before it starts rolling off, a subwoofer would be required for those folks demanding that last bit of extension. Personally I don’t care much about that sort of thing, as there’s just not really all that much musical information down there. Since the Valentina hits 30Hz so well, it doesn’t feel like anything significant is missing, unlike many others which claim a 30Hz-20kHz response but feel lacking in low-end authority. I have no qualms about calling this a full-range system but your expectations may differ from mine. I did connect my old pair of B&W ASW800 subs just to test things out. If you aren’t familiar, the ASW800 launched about a decade ago, and is very musical and clean if not the last word when it comes to infrasonics. At 77 pounds each and sporting 1kW worth of Class D power, I think these went for $2,200 each when new. So, likely not on par with the current state-of-the-art, but certainly not chopped liver. And for all that weight and bulk, guess what? They ended up adding very little to the JansZen experience. Only with certain electronic tracks or the occasional Felix Hell release did I find it worth the trouble. It took me far longer to dial in good response from the subs than it had to get the Valentinas singing, and I don’t think the sprawling final placement would be sustainable in my home. Honestly, if this was my long-term system, I don’t think I would bother unless I also used it for serious home theater. Lastly, it has to be said that the sweet spot on these is somewhat limited. Certainly not “head-in-vice” small as I’ve heard from other ‘stats, but neither does it approach anything like the largest I’ve heard. My Usher Dancer Mini One, for example, with the proprietary diamond tweeter, is able to give unwavering sound for almost the entire length of my sofa, so that 3 or possibly 4 people can share a nearly identical experience. The Valentinas are limited to a space more appropriate for 2 listeners sitting close together in the middle of the sofa, or just a single person in a chair. Let’s recap, shall we? The JansZen Valentina Active system is a stunningly detailed yet convincingly organic experience unlike anything else I’ve heard. 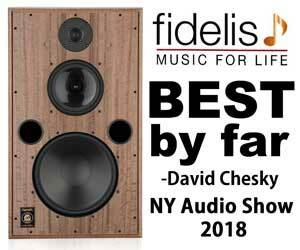 It has a rich, engaging presentation with deep resolution and a headphone-like coherence, matched only by the best single-driver designs — all while managing to avoid that grating “faux-high-fidelity” sound which so many speakers seem to strive for these days. This alone is already a noteworthy achievement, but what really sets the Valentinas apart is their spacious presentation. Put simply, I have never heard a speaker carve out such a realistic soundstage, whether in my home, or at a show, or in the demo room of a dealer. That this was accomplished in my untreated and imperfect room is nothing short of miraculous. Possible shortcomings, which didn’t bother me in the least but may be something to consider for others — sheer output for extreme SPL listening in cavernous rooms, lack of extremely low-bass impact, a modestly-sized sweet spot, and a demanding nature which reveals sub-par sources. And … that’s it. The Valentina Active system is world-class in every other regard. Several folks have told me they measure my enthusiasm for a product by the length of my review. I hadn’t noticed that and I’m not sure it’s always accurate, but in this case perhaps the theory works. I suppose it makes sense on some level – things that get us excited end up being easy to talk about. All I can say is I’m floored by the sound and the level of value the JansZens have to offer. They earn, without a doubt, my highest possible recommendation. John Grandberg has a decent speaker-based system but spends most of his time with tiny speakers strapped to his head, or sometimes even inserted into is ears. Gross. John tries his best to eschew purple prose but occasionally has trouble avoiding sesquipedalian loquaciousness. Shockingly, he doesn’t “do” vinyl, being utterly content with his ever growing collection of music stored in lossless digital form. He is terrible at photography and apologizes in advance for the shoddy pictures he might force upon his hapless readers. Consider yourself warned. yes, thanks John for a great review. I’m not a headphone junkie, but I am bothered by many of the same colorations and distortions common to ‘conventional’ speakers that you list. I agree that you should pen more speaker reviews. and I’ve got to hear some JansZens! Thank you – I do have coverage on deck of the Egglestonworks Emma, a very enjoyable modestly sized/priced “conventional” speaker. Having just read this review at speed, and being the first owner of these wonderful speakers in the UK (I’ve had ’em just over a year now) I can echo and heartily agree with all the positivity. As an old friend (we were both students at the Royal Academy of Music in London many years back) said after a lengthy demo “These are true ‘reference’ speakers”. I run mine off a modified Oppo 105D ‘Signature’ and use the digital preamp which works well and keeps clutter to a minimum. The real-world advantage of positioning and “not even close to barn door” dimensions are huge advantages and these will work in small to medium size rooms as well as big domestic spaces. The beam that is a given with panel speakers is not a big problem and with air-layer on a low setting and a good deal of toe-in I get room filling splendour. David Janszen is an especially clever, decent, helpful and deeply committed asset to the Janszen family line and Arthur A must be looking down with great pride! Compared to the bass roll off rate of reflex loading, a sealed system more closely mimics inverse nominal domestic sized room gain below 100 Hz. With all due respect, the above described effect, more than theoretically better group delay, defines the perceived performance advantage of sealed over reflex systems. If/when reflex tuning frequency matches a room mode frequency, the result is the dreaded bass “drone” or so-called “one note” bass effect. Sealed systems have no such potential negative. It’s anti-intuitive, but non-symmetrical L/R bass output results in less bass mode effects than symmetrical L/R bass output. To increase L/R non-symmetry, plug the port of one speaker channel while leaving the port open on the other speaker channel. Plumber’s so-called “test plug” can air-tight seal ports, better than using cloth, which leaks air. Finally, for speaker’s w/rear ports, plugging them (again, air tight) can assist w/minimal front wall clearance. Re. The sealed vs ported vs transmission line argument, and noting that firms like Martin Logan and Sanders use ported or TL loading in hybrid electrostatic products, I think David Janszen’s argument is that the fundamental speed of the infinite baffle is hugely important, and that the roll off characteristics can be better managed. And of course without ports the speakers can be located closer to walls and people can listen closer without odd bass effects based on wavelength and room sizes. David advises the non symmetric location approach in his set-up notes to help reduce any odd bass effects caused by the room. It’s especially important to get the speed to allow for decent integration and these Valentina / zA2.1A-HP marvels are extraordinary in this regard. I’ve heard most of the latest Martin Logans and while these look impressive and do bass well, the size of the panel makes the integration less natural. Better than they were but not great, and I simply couldn’t locate the MLs properly in my room. As the reviewer so sensibly notes, most of us have to compromise on rooms and here the JansZens are without peer in their hybrid nature. I really want to hear a decent (almost) full range ESL but unless this gives me a new and unexpected experience my view is that a properly considered and well implemented hybrid is the best of all worlds. In my room the JansZens go down low – certainly there is decent bass to 30Hz (using audiophile test album) and some activity well below that and very few real audiophiles will want more. I have had faultless personal service from David with queries and issues, and feel well supported in the UK despite the distances, so can heartily recommend the ownership experience too. Thanks for that comment. All due respect back atcha: (1) the shorter bass group delay from sealed enclosures is actual, not as you say theoretical, and having shorter group delay is truly better, at least in this application, where the crossover is at a relatively low frequency to electrostatic transducers with very short group delay; and (2) a serious problem with ports in general is that they are resonant, and thus impart unnatural bass ringing at the *source* of sound, regardless of room modes or what type of midrange or treble transducers are present. Of course, room modes are also a form of resonant behavior in the bass, and minimizing or getting rid of them is an improvement, especially when one wants a most natural, you-are-there experience. On the other hand, our hearing apparatus is better adapted to the acoustical behavior of our surroundings than when the source of sound is convolving its own resonant behavior with the recorded sound. The notion of asymmetrical L/R bass response is off topic, but interesting, although I’d say using a sock or wad of paper is better than sealing with a plug because (1) the speaker is designed to have a port, i.e., its alignment includes the port’s effect (the Qts of the woofer/enclosure system will be thrown off more with port sealing than with port damping), and (2), a leaky wad damps the resonance without entirely stopping it, which allows the port to extend the bass a bit without ruining it. Bravo! You may not be a fan of speakers, but you’re a great reviewer of speakers. I have been into audiophilia all my adult life and this is as good a review as I have read. Nitpicking I would have liked to see a few words about soundstage height since the Janszens are not tall, but I’m sure the side tweeters help on that. Thank you! It means a lot, as I know I am primarily a headphone guy and recognized as such by my readers. Plenty of experience with speakers too, but not so much experience writing about it. As for soundstage height, the Valentinas are the same in both height and width – not massive, but “big enough” and incredibly believable. As you can tell from the pics, they sit with an angle, which can be adjusted based on your height while seated. Get this wrong and you’re more likely to have a somewhat squished presentation. Get it right though (and it’s not all that hard to do) and localization is excellent on every axis.